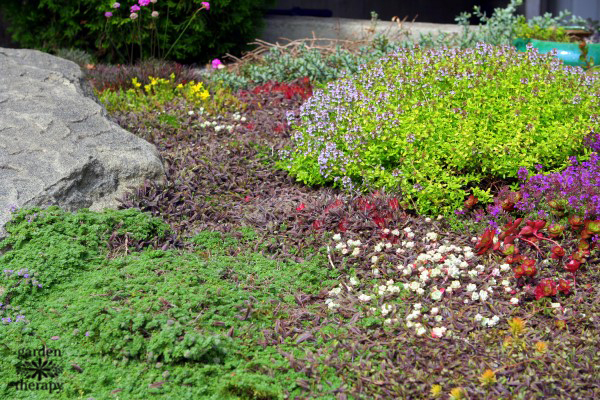 Using low-growing groundcovers to create a patchwork of color, texture, and shape in the garden—AKA carpet gardening—was the trend that resonated the most with me as I toured the show gardens at the Northwest Flower and Garden Show in 2016. For years I have been drawn to planting shorties in the garden. 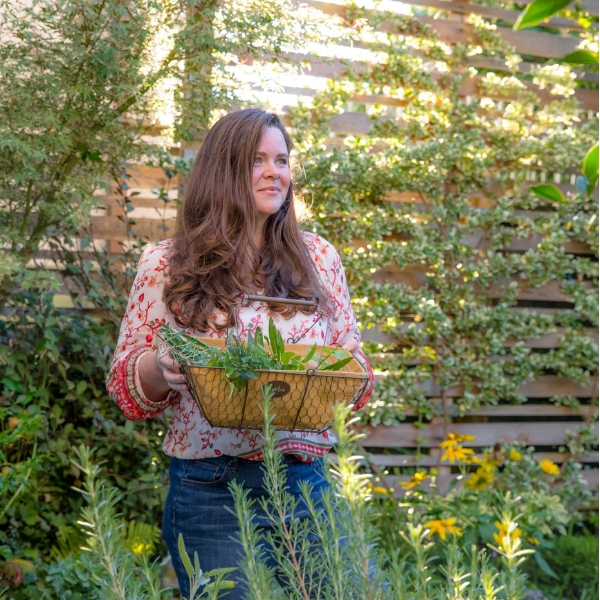 With a small urban garden and a love for groundcovers, it can be a way to decorate a “jewel box garden,” the name my mother fondly calls my space packed with dwarf cultivars and decorative showpieces. 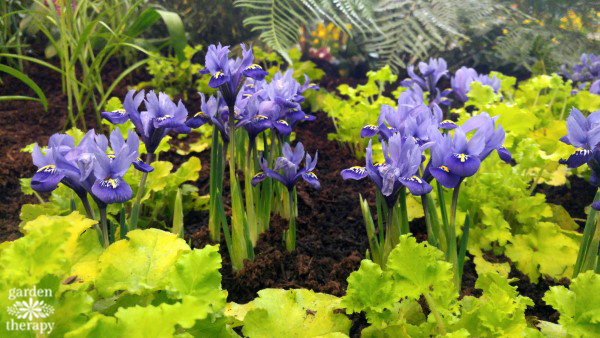 The carpet is decorative as it fills in the space but it also allows a few single stunning plants to shine like jewels. This striking feature garden, the Tiny Tetons created by Nature Perfect Landscape and Design, used plant carpeting to create the illusion of the meadow-like setting of Wyoming’s Grand Teton National Park. 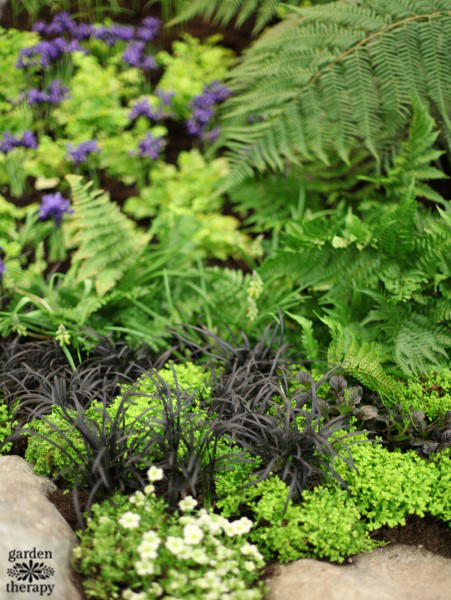 Many of the display gardens also created a tapestry of plants intermixed with stone to create a lovely, low-growing landscape without the use of lawn. 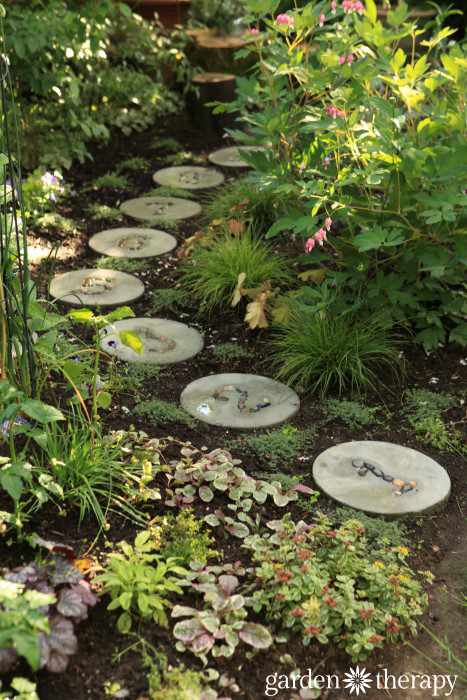 These photos are from Adam Gorski Landscapes show garden, Discovering Alaska. 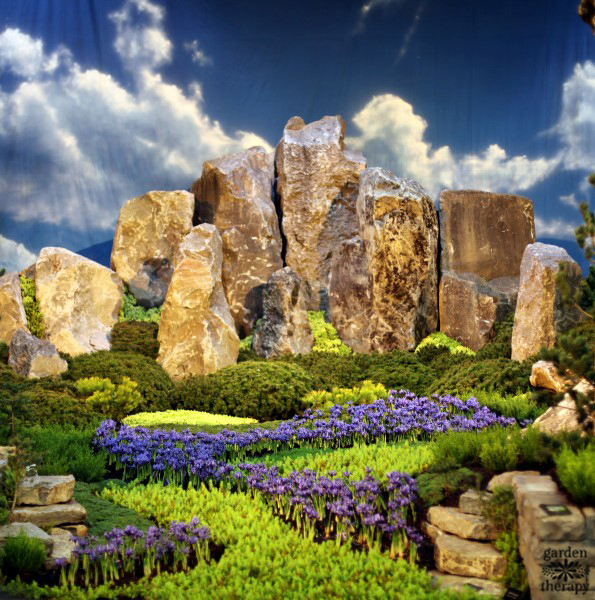 A variety of plant material, some native to Alaska, were used to create a depiction of a lowland meadow. 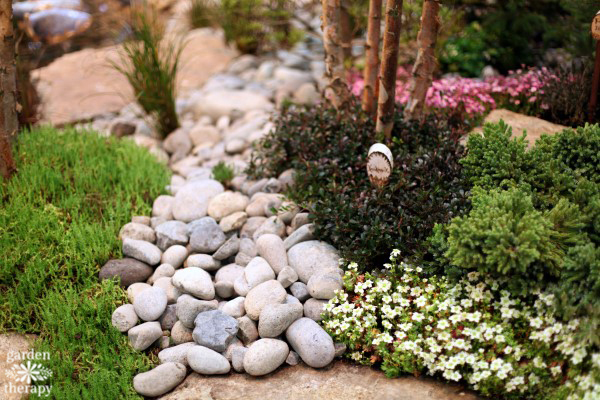 The use of river stones, boulders, and plants creates artistry through structure. Designer and Plantswoman Susan Calhoun created A World Away on Na Pali Coast, a tropical paradise that was lush and colorful. Susan even did a seminar on carpet gardening. Be sure to visit her website, Plantswoman Design, for a summary of the talk. 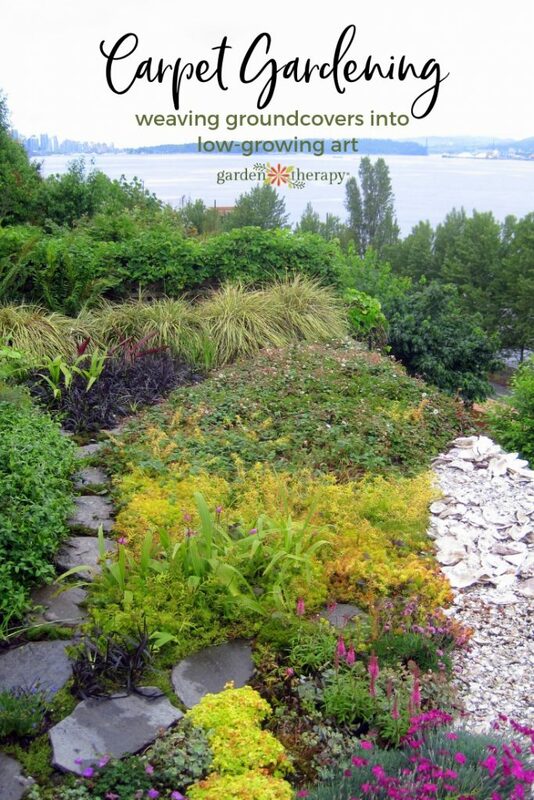 Look for Susan’s article, Keeping it Low, in Fine Gardening magazine. 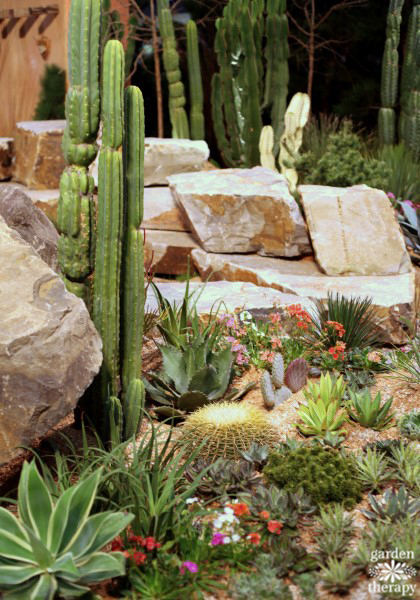 This succulent and cactus garden shows another version, this time with water-wise landscaping. 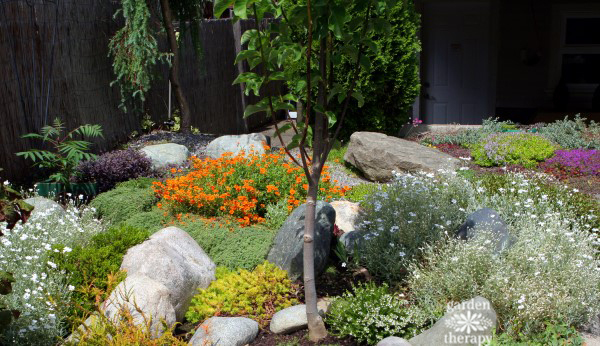 The garden pictured below, entitled Southwest Serenity, was created by the West Seattle Nursery to showcase warmth and natural beauty in drought-tolerant landscape design. Back in 2009, I snapped a few more photos from a small urban landscape on a garden tour. 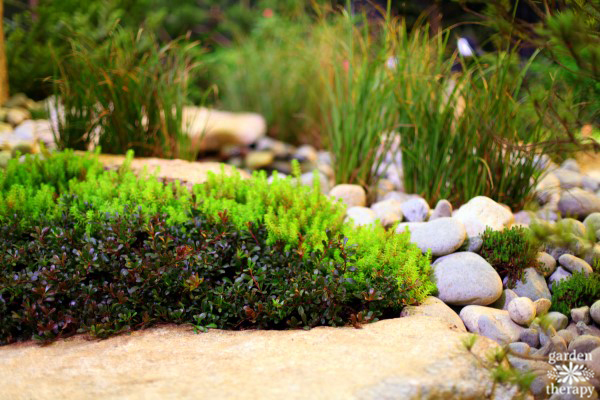 I was eager to see lawn replacement options like this, that create a beautiful landscape without all of the water-hogging turf grasses that are a going concern with pests like the European Chafer Beetle. These designs are more wild and organic than the ideas shown in the show gardens and may appeal to home gardeners looking for a relaxed landscape. Whether you are planting in patterns or creating a looser design, the idea remains the same. Carpet gardening works well on rooftop gardens as well. 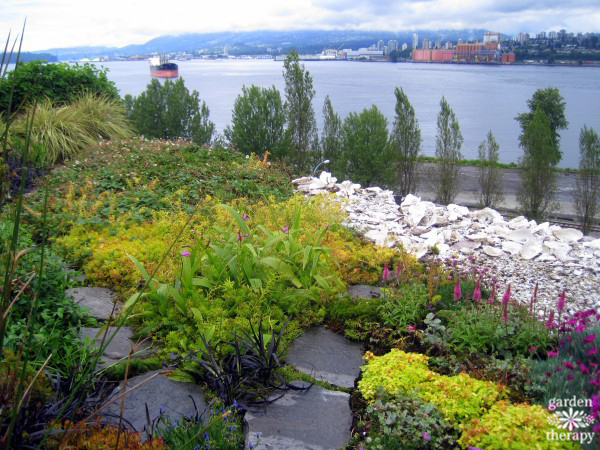 I spied this oceanview green roof on the East Vancouver Garden Tour a few years ago. 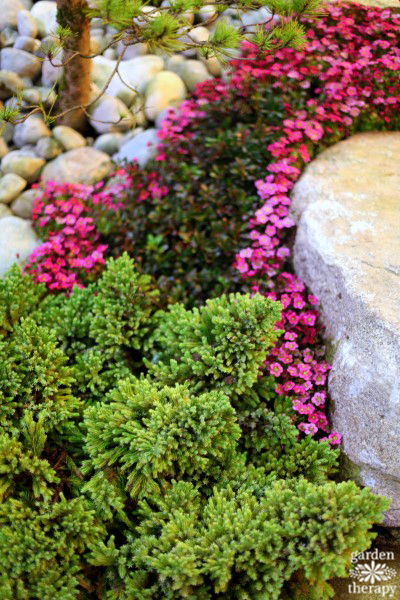 A mix of seashells, sedum and other drought-tolerant ground covers made for a green space that didn’t take away from the industrial ocean views. 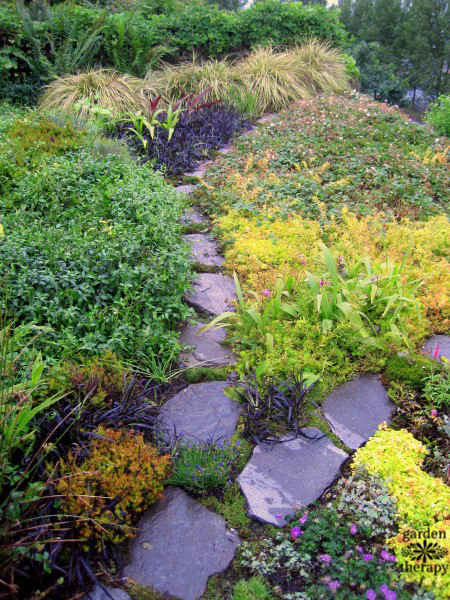 My own backyard play garden has built in some of the concepts of carpet gardening, with a mix of woolly thyme, tri-color ajuga and hopscotch stepping stones winding a path through a kid-friendly garden. This space was designed to be a maximum of 18″-24″ in height, but most of the plants are 6″-12″ to appeal to my toddler as he cruises through to smell the flowers, pick ground cherries, or touch the bunny tail grasses. 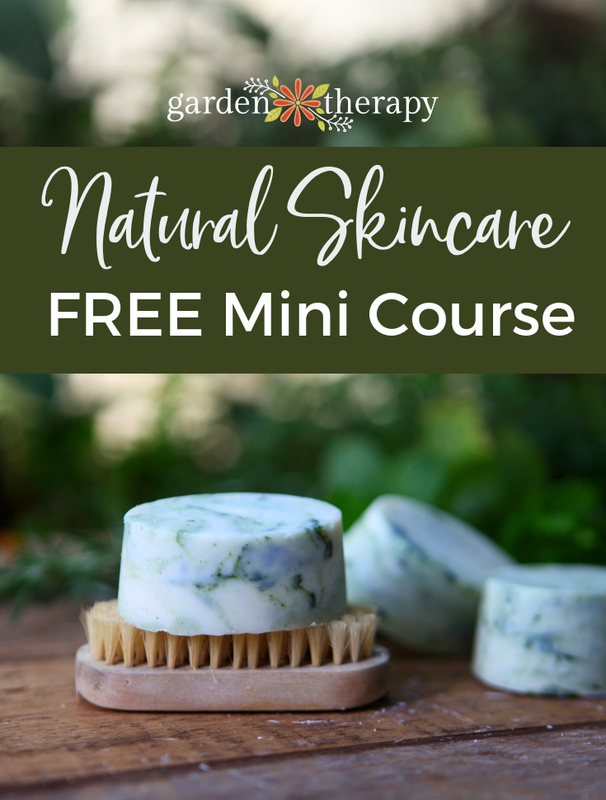 My play garden will be growing in more this year and I plant to work on the groundcovers to create more interest and take these ideas out to some of the other areas of the garden as well. For more information on plant choices, Susan Calhoun has a great resource list from her seminar which you can see here. Jumpin phlox – I love that! What is the pink flowered groundcover in the first photo? It looks great paired with what I think is ajuga. Love your posts – the carpeting theme is very eye catching which I intend to have a go at this weekend. garden therapy is a great name and so very apt to all gardeners.